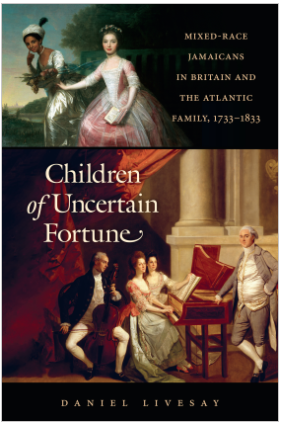 A central thread running through Daniel Livesay’s Children of Uncertain Fortune is deceptively simple: Atlantic families structured the development of ideologies surrounding race in the British empire during the long eighteenth century. Woven through the book, however, is a richly nuanced exploration of what terms like Atlantic, family, race, and empire meant and how understandings of those terms changed over a pivotal hundred-year period starting in the 1730s. Through institutional records and family papers produced on both sides of the Atlantic, Livesay identifies 360 mixed-race people from Jamaica and traces the lived experiences of a handful of them as they navigated their social and economic position within transatlantic kin networks. Those individual narratives reveal how Britons experienced empire through family ties in ways that shaped their perceptions of race, colonialism, and belonging. Children of Uncertain Fortune balances the very personal family dynamics surrounding mixed-race Jamaicans with the wider imperial and global changes that shaped their position within British society. The book starts in the 1730s with the turmoil surrounding the Maroon War and concerns over population ratios in Jamaica. As the enslaved population far outnumbered free white colonists, the colonial assembly debated using economic privilege, rather than race, to determine political and economic inclusion in colonial society. They decided to exempt individuals in Jamaica less than four generations removed from African heritage from discriminatory laws, unlike surrounding British colonies that applied a one-drop rule for racial designations. But, as Livesay describes, the boundary between acceptance and exclusion “grew increasingly blurry at the highest rungs of the social ladder” as white elites in Jamaica viewed the mixed-race children of wealthy men as a bulwark against the enslaved population (31). Practically speaking, this meant that elite Jamaicans of color, regardless of how many generations removed from slavery they were, petitioned for and were granted privilege exemptions from discriminatory laws. Traveling to Britain for an education provided an avenue to social and economic mobility for many of these mixed-race Jamaicans. Letters and wills provide Livesay with evidence of white fathers who chose to send their mixed-race children to Britain and details about their reception by British kin. In some cases, mixed-race Jamaicans capitalized on Britain’s global empire by taking posts in India or marrying individuals employed by the East India Company. The children of Jamaican planter John Morse, for example, exemplify the ways in which some mixed-race individuals used India to formalize their “own imperial advancement” (110). The ease with which Livesay’s mixed-race West Indians traveled and benefited from Britain’s imperial reach raises Nicholas Canny’s critical appraisal of Atlantic history as a field, specifically, where Atlantic history becomes global and what that means for things termed “Atlantic.” For the mixed-race individuals studied by Livesay, tenure in India remained limited to gaining wealth and prestige that could be leveraged back in England and Scotland for social respectability. In an interesting way, then, becoming Indian nabobs helped some mixed-race Jamaicans blur connections to their enslaved Caribbean heritage. By the 1780s, however, the American Revolution reshaped Britons’ perceptions of their empire in ways that negatively influenced the possibilities open to mixed-race Jamaicans. Following the trial for corruption of Bengal’s governor, Warren Hastings, public opinion in Britain turned critical of colonial wealth. For some mixed-race Jamaicans, according to Livesay, high economic standing “originating in the vices of colonial plunder and oppression, was becoming a liability, rather than a virtue” (145). Wrapped up in public discourse surrounding colonial corruption were concerns about racial infiltration in Britain. So, as rhetoric turned against mixed-race migrants but white fathers continued to send their children to be educated among kin in Britain, mixed-race Jamaicans proved less able to integrate themselves into British society than their peers had done even a decade earlier. As mixed-race Jamaicans navigated family networks in Britain at the end of the eighteenth century, imperial debates surrounding the abolition of the slave trade re-centered marriage and childbearing in imperial discourse on both sides of the Atlantic. Abolitionists and pro-slavery reformers saw the future of slave labor in the Caribbean in terms of natural increase, which meant that mixed-race children “were more problematic than before” because their birth did nothing to increase the enslaved or white populations (203). And, while Sasha Turner’s new book Contested Bodies: Pregnancy, Childrearing, and Slavery in Jamaica, 1780-1834 traces what this meant for enslaved mothers and families on the island, Livesay explores how this changing rhetoric created a negative bias against mixed-race children in Britain and Jamaica. In a decade of social turmoil, moreover, a small uprising led by two French West Indians of color on the neighboring island of Saint Domingue shocked British observers. For commentators concerned with practices of educating mixed-race individuals in Britain, Vincent Ogé and Julien Raimond loomed as examples of the ways in which European education could radicalize people of color. And, when turmoil in Saint Domingue turned into a full-scale slave rebellion, British commentators imagined a clear connection between that rebellion and the education of Ogé and Raimond in France. Perhaps unsurprisingly, opportunities for mixed-race children constricted during the end of the eighteenth and beginning of the nineteenth centuries, although there still remained some room to maneuver and white fathers continued to send their children to Britain. Even as the East India Company banned mixed-race people, for example, a Jamaican planter placed his mixed-race son in their service by selecting clothing that minimized the darkness of his skin for the day of his interview. On the whole, however, racial prejudice worsened over the period of time covered in Children of Uncertain Fortune. By the early nineteenth century, as Livesay explains, “Class could no longer outrank race, and Britons began lumping elites of color into the totalizing category of ‘black’” (399). That eventuality, however, was shaped by family dynamics more so than political or cultural debates. After all, as Livesay makes clear, Britons confronted race through their mixed-race kin or those of their neighbors. It is Livesay’s ability to give glimpses of those quotidian and intimate encounters with race and colonialism in Britain’s Atlantic empire that make this a book worth reading, re-reading, and assigning. Stay tuned tomorrow for a Q&A with the author! The book builds on a developing historiography on families and the Atlantic world but for a good overview, see: Julie Hardwick, Sarah M.S. Pearsall, and Karin Wulf, “Introduction: Centering Families in Atlantic Histories,” William and Mary Quarterly, Vol. 70, No. 2 (April, 2013): 205-224. Nicholas Canny, “Atlantic History and Global History,” in Jack P. Greene and Philip D. Morgan, eds., Atlantic History: A Critical Appraisal (New York: Oxford University Press, 2009): 321.